A landmark decision of the High Court of Australia that Aboriginal people have the right to issue fishing licences opened up a multi-million industry to them. What is the Blue Mud decision about? On 31 July 2008 Australia's High Court decided that it was illegal for the Northern Territory Fisheries Act to allow licenses to be issued for fishing in waters that fell within the boundaries of land covered by the Aboriginal Land Rights (NT) Act . Although the court's decision relates to Blue Mud Bay, about 550 kms east of Darwin, it will affect 80% of the Northern Territory's coastline. Read why the Blue Mud Bay case is one of the most significant for Aboriginal land owners since the High Court's Mabo decision. The Blue Mud Bay decision granted traditional owners exclusive native title rights to the intertidal zone. It means that fishing licenses issued by the NT government are illegal. It's the Aboriginal Land Council that is entitled to grant these licenses. Moreover, it means that commercial fishers cannot enter Aboriginal land without permission which means they can't fish there either. This was bad news for commercial fishers who mainly fish for Barramundi, mud crabs and trepang (sea cucumber). All three species are almost always caught between the low and high water marks. Hence Aboriginal people now control access to the waters of a major fishery. It stretches over 80% of the coastal area of the Northern Territory because this is the area covered by Aboriginal land. 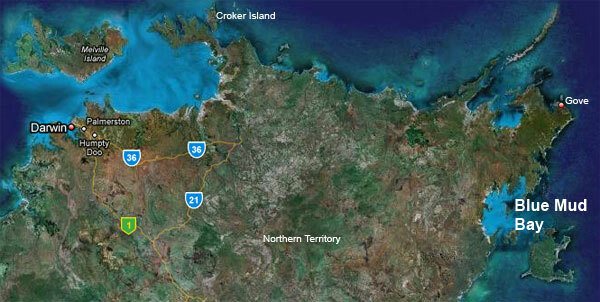 A map of land use in the Northern Territory shows that about 80% of the coastal area is Aboriginal land . Aboriginal land had been granted as freehold to the low water mark of the coastline since the 1970s . Aboriginal people now had to negotiate new licensing agreements with white commercial fishers regarding fishing in the intertidal zone and tidal rivers, a task that stirred mixed feelings on both sides. Production value from commercial fisheries. Approximate number of recreational fishers in the NT. People employed directly in the seafood industry. The Blue Mud Bay decision allows Aboriginal people to achieve economic, social and political prosperity by allowing them to make decisions over their resources, a fact proven by research from North America and Australia . However, non-Aboriginal Australia responded in a patronising way to the Blue Mud Bay case. While Aboriginal prowess is accepted in art and tourism, a mainstream commercial approach is not accepted as soon as it might impact established white interests. Worse, Australian politicians support this view. The Blue Mud Bay case was not an isolated case brought before the High Court. Its roots reach back into the 1960s when Aboriginal people fought for rights to their land. Yolngu clans from Arnhem Land submit petitions to the Commonwealth parliament objecting to a proposed Nabalco bauxite mine at Gove (also known as Nhulunbuy; see above map on the far right). The NT Supreme Court decides on the Gove Land Rights Case and rules that the Yolngu could not prevent mining on their land, ie. there was no 'native title'. The case subsequently led to the establishment of a Royal Commission into Aboriginal Land Rights. The Australian government develops the Aboriginal Land Rights (Northern Territory) Act. The act had been designed to grand Aboriginal land to extend two kilometres out to sea, past the low tide line. But the final act extended Aboriginal land only to the low water mark, an important detail which later affected the Blue Mud Bay case. Land grants elsewhere in Australia commonly extended even less, to the high water mark. For the next 30 years the NT government issues commercial fishing licenses to white operators to take fish between the high and low water marks, on Aboriginal land. July: Traditional owners of Croker Island, on the northern tip of the Northern Territory, try to assert their rights to exclusive possession, ownership, occupation, use and enjoyment of the sea and seabed surrounding their land. The Federal Court rules that native title exists over the area claimed, but finds the rights are 'non commercial', ie. Aboriginal people had to share the seabed with everyone else and could not benefit commercially without obtaining a licence from the government. Australia's High Court upholds the decision in 2001. The Northern Land Council (NLC) launches the Blue Mud Bay case on behalf of the Yolngu people. The High Court was asked if the Northern Territory Fisheries Act had the power to give someone a license to fish in waters that were Aboriginal land - that fell into the boundaries of land covered by the Aboriginal Land Rights (NT) Act. The Federal Court rules that land grants under the Aboriginal Land Rights (NT) Act allowed commercial fishing to the low-water mark but did not confer a right to exclude fishing in tidal waters (ie. to the high-water mark) . The Northern Land Council appeals against the 2005 Federal Court decision. This time the Federal Court finds that "the NT Fisheries Act did not apply to the grant areas" and did not allow to issue "licences to authorise or permit fishermen to enter and take seafood from those areas". While the Yolngu people had won in the Federal Court, the NT government appeals now to the High Court. July: Ten years after the first legal battle the High Court of Australia decides that the Yolngu people own the fishing rights over their land between the tidal low and high marks. Commercial fishing licenses need to be issued by the Aboriginal Land Council, any licenses issued by the NT government are invalid. Many threats endanger Aboriginal land and Aboriginal peoples' heritage, history and sacred sites—are you one of them? Discover the multitude of Aboriginal sites and places and how Aboriginal people used them, sometimes for generations.